Notice: We have pre-installed the latest North & South American maps. The new map will be updated at first and last quarter of 2018. And the instructions in the package will tell you how to update the map. If you have any questions, please contact us. High definition 7 inch large screen display clear navigation quality, touch sensitivity can be easy to operate. The navigator provides the real direction guide, and tells you exactly which way to go before you close to the exit, turning or difficult intersection, so that you can stay on the right road. Life free maps updated by two times a year. You can update them according to the instructions in our package. 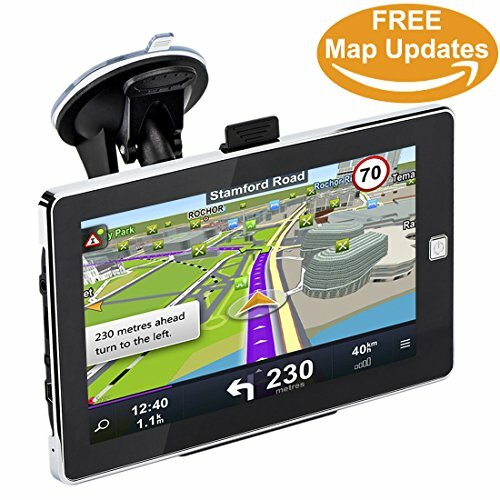 Is there not only a navigation function, such as music, movies, games, radios, and you can completely relax yourself after you're tired of driving. 90 days of refund guarantee and life-long warranty - we provide you with a 100% satisfaction and 90 day free refunds, life-long warranty. If you have any questions about this product, please contact us through Amazon information. We will answer you in 24 hours. If you have any questions about this product by MYH-Mart, contact us by completing and submitting the form below. If you are looking for a specif part number, please include it with your message.